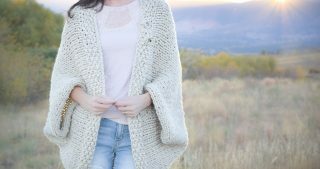 I recently shared a crocheted Cascading Kimono Cardigan Pattern here on the blog so I thought it might be fun to share this knit kimono pattern today! 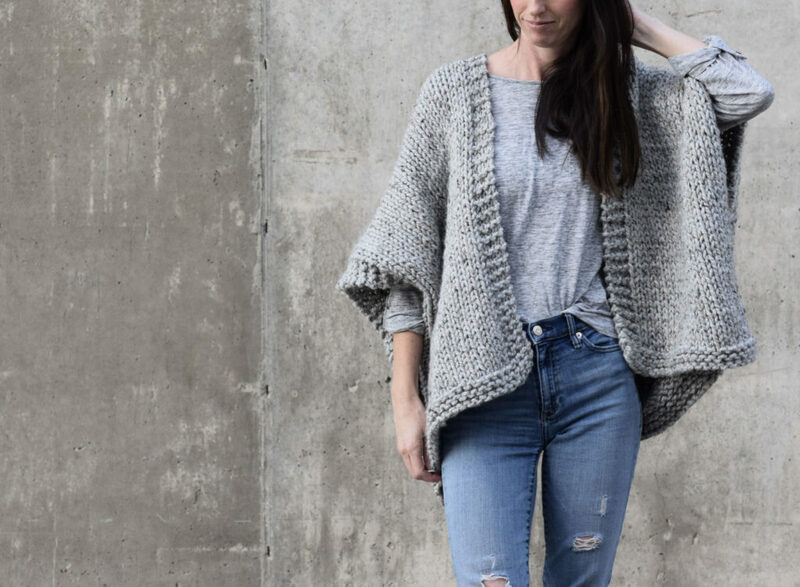 This particular kimono is completely beginner friendly and it’s made with my all time favorite super bulky yarn and large needles. 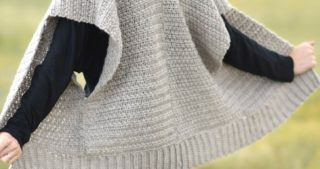 It’s so comfortable to wear and it’s warm too as it’s made with a wool blend (a soft wool blend – I don’t do that itchy scratchy stuff too well). And if you can’t wear wool, you can easily substitute any super bulky yarn that you like for this pattern. It’s perfect to curl up with on the couch or throw on for a brisk morning stroll. I’ve been enjoying some amazing fall strolls and I’ll share a shot of some changing Aspen leaves at the bottom of this post. Anyway, this project actually reminds me a bit of the Easy Knit Blanket Sweater, and it’s just as comfortable to wear if not more so since you don’t need a button to keep it in place. 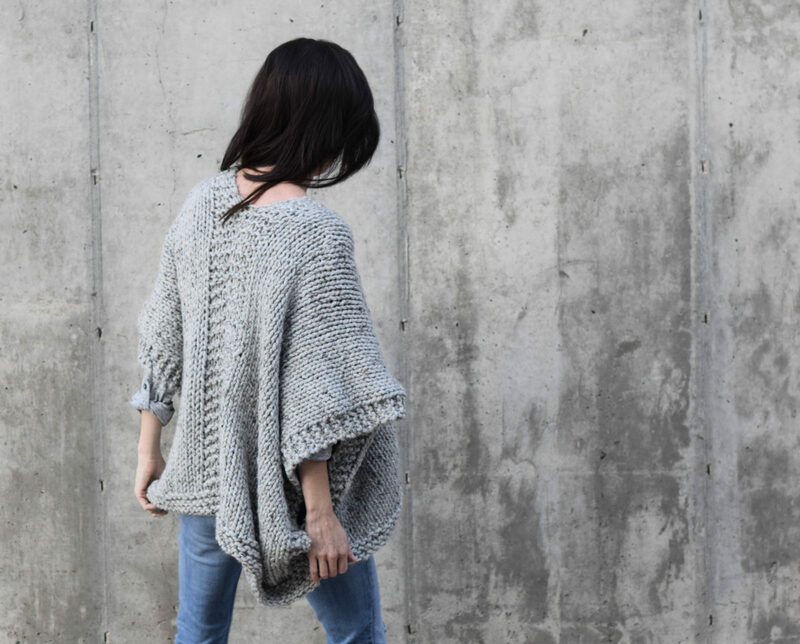 It also could probably be classified as a poncho, but since the sides are seamed it is a bit more of a cardigan or “kimono” than a poncho to me. Call it what you want, but call it cozy cause it is! (I’m so cheesy) And do you like to wear grey too? It’s such a versatile color and it’s always been a fave of mine to wear since it doesn’t show dirt and it’s a good, soft neutral. UPDATE: You can now find this as a kit on Lion Brand’s Website HERE! Above – the flowers are from my backyard and the deer antlers were found on a hike near Woodland Park, Colorado. The deer shed them naturally and then they regrow. This is another pattern that is beginner friendly yet super chic to wear. If you scroll to the bottom of the pattern below, you can see the photos and how it’s basically two rectangles seamed together. 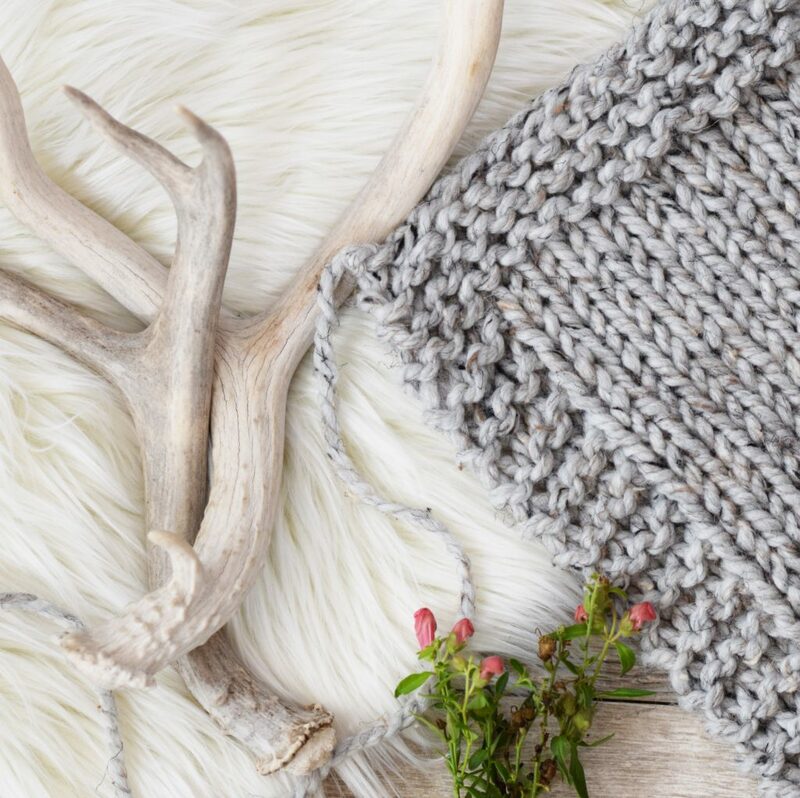 If you can knit and purl, this will be easy for you to make for yourself or as a gift for a friend or loved one. 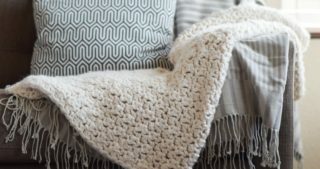 If you haven’t learned to knit, you can find my tutorial and video in this post HERE using the method that I find easiest. Below you’ll find the free pattern or you may choose to purchase the ad-free, printable PDF version from my Etsy shop here. 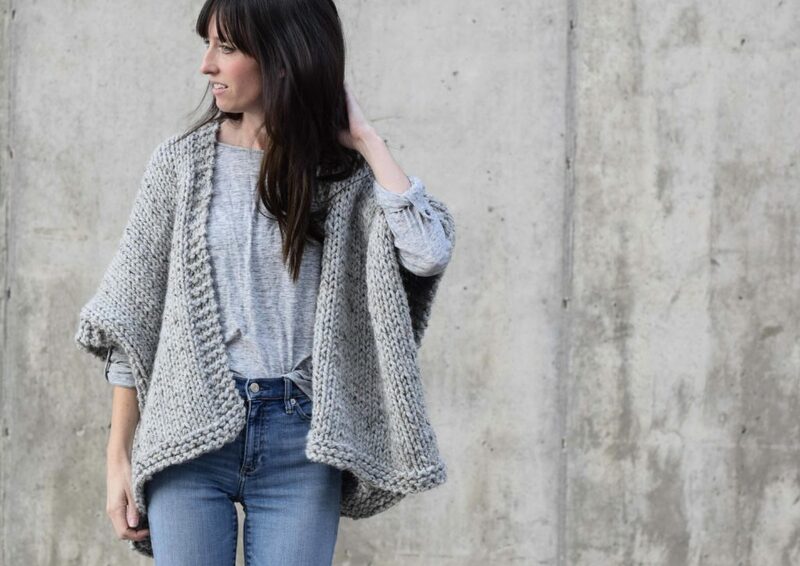 It doesn’t get comfier or warmer than this cozy, beginner friendly knit kimono. 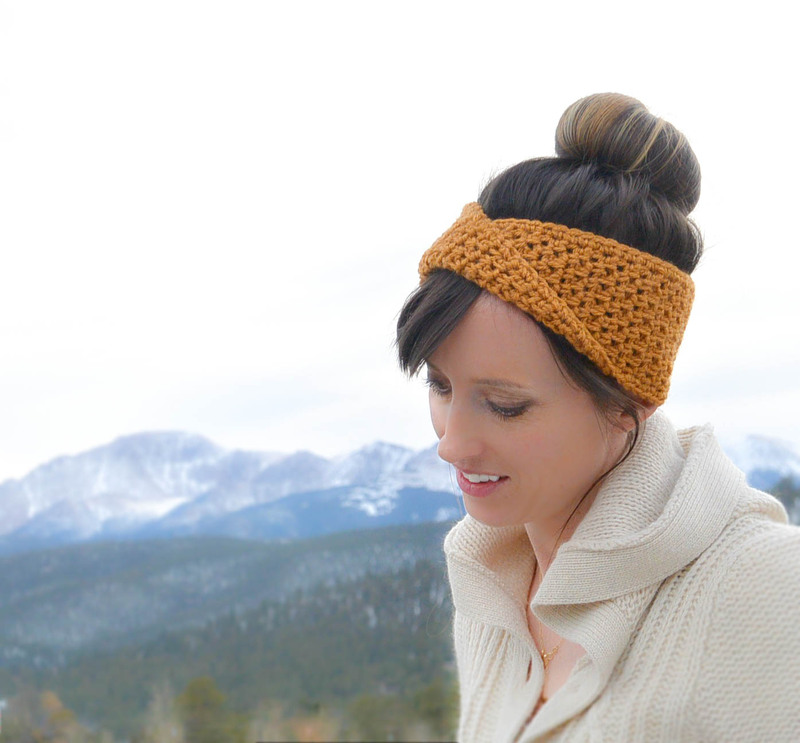 Made with super bulky yarn and large needles, it works up fairly quickly and is a dream to wear on cold days. This kimono is made by knitting two simple rectangular panels (knit flat) and seaming them together at the center back and sides. If you are comfortable with the knit and purl stitch, you can easily make this kimono! 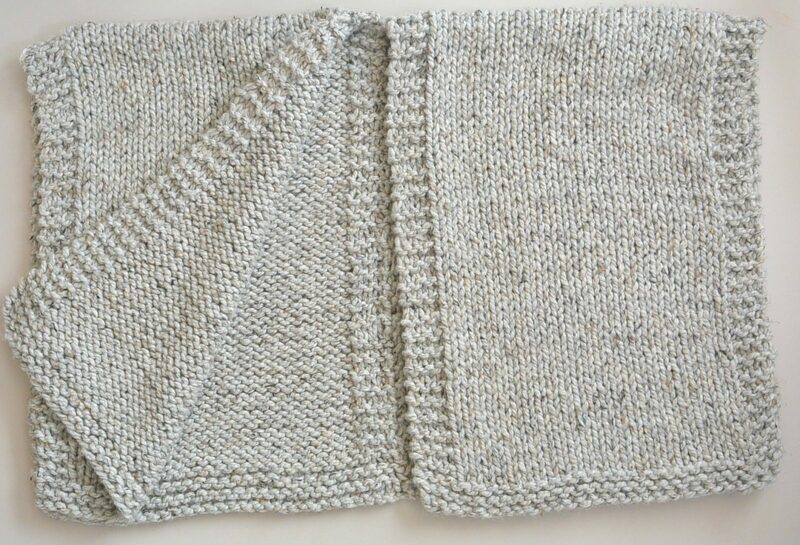 The sides of each panel are worked in garter stitch and the center is stockinette. There isn’t any fancy ribbing or shaping involved. Slip the first stitch of each row in order to keep cleaner edges. Circular knitting needles are used in order to fit all stitches on the needle, but panels are worked flat just as you would do with straight needles. *This is a fairly short kimono. You can make it longer by knitting more rows for each panel. If you are making this for someone who is tall or with a large bust size, consider adding more rows to each panel in order to make the kimono longer. In addition, just before casting off, you may place the panel centrally over one shoulder as it will be worn in order to see if you are happy with the length. Adjust accordingly. Place panels side by side with wrong sides facing up. With a length of yarn and your tapestry needle, whip stitch seam (or use your preferred seaming method) from the bottom of the pieces upward until you reach the center of the panels. Tie off and weave in ends. Fold upper portion of panels down and seam up the sides of each panel with whip stitch seam or preferred method approximately 5” inches on each side. Tie off and weave in ends. Seamed up the center back and fold down front. Next seam up the sides. 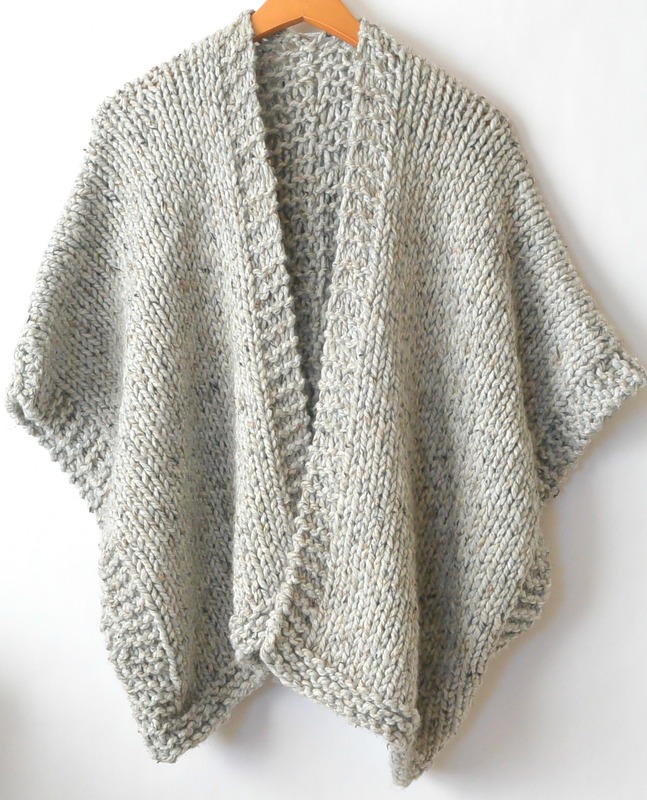 I hope that you enjoy your new, super cozy kimono and happy knitting! Previous Post: « Katherine Heigl Talks Knitting! Oh my gosh yay!!! This is exactly what I’ve been looking for!! Thank you!!! Jessica, I love this pattern. So easy and it will be nice and warm for fall and in early spring. I am definitely going to try it and will try to post a picture when I finish it. Thanks for all the great patterns. Gorgeous as always! I love all your pics too! so glad to have found you!!! so many amazing patterns to make!! thank you!! This is cute as pie, and looks easy to make. Thanks Debi! Yeah, it’s super easy. If I wanted to make it one size larger (for larger around), how many stitches would you suggest? Thanks! Hi 🙂 I don’t know if you got an answer yet, but I’m a size 14 and I wanted it oversized so I cast on 45 stitches and it’s perfect for me. Here is what I did. I didn’t want super bulky yarn, had enough yarn #4 I wanted to use. I cast on 70 stitches and knitted about 10 rows then measured from my neck down my are where I wanted it to reach. Likewise, laid it over my shoulder to determine length front and back. Almost finished. I forgot to add I used size 10 1/2 size needles. Yay! Let me know if you have questions Kay! I do thinking about it. You say to slip the first stitch of each row. On row 6 does the first stitch of the k4 include the slip 1. Would I slip 1 then k3? Thanks! Good question Kay, I was wondering the same thing. Also she says to leave a “Generous opening” for the sleeves but how big is that? In the assembly instructions I’ve written to seam up each side just 5″ which leaves a large opening. 🙂 Hope that helps! Add one stitch to any knitting pattern to slip before you knit your pattern. Gives a fabulous edge. So glad I learned this. With this kimono pattern its not necessary to add one just get the width you want, slip one and then follow the pattern. I have the same question as Kay (newbie knitter) about the slip one at beginning of each row. Thanks! Hi! I always slip the first stitch of my knitting (when I knit flat on projects like these). If it’s a knit stitch, slip it knit wise. A purl stitch, slip it purl wise. Hope this helps! Two thumbs WAY up This looks so chic it’s hard to believe how simply it’s made. It’s similar in shape to the cardigan I am knitting right now. Thank you Jessica, how do you crank these out so quickly? The knitting mojo returns … hehe! I sure hope you enjoy it Linda. And you’re welcome of course. Happy knitting! Jessica, I adore this kimono! I don’t have any bulky yarn but do have plenty of DK & sock so I want to try it with some strands held together. We’ll see what happens 🙂 Thank you for sharing your pattern! That’s great to hear Martina. Congrats on getting back into the hobby! How fun! Happy knitting Diane! Well hey my neighbor! 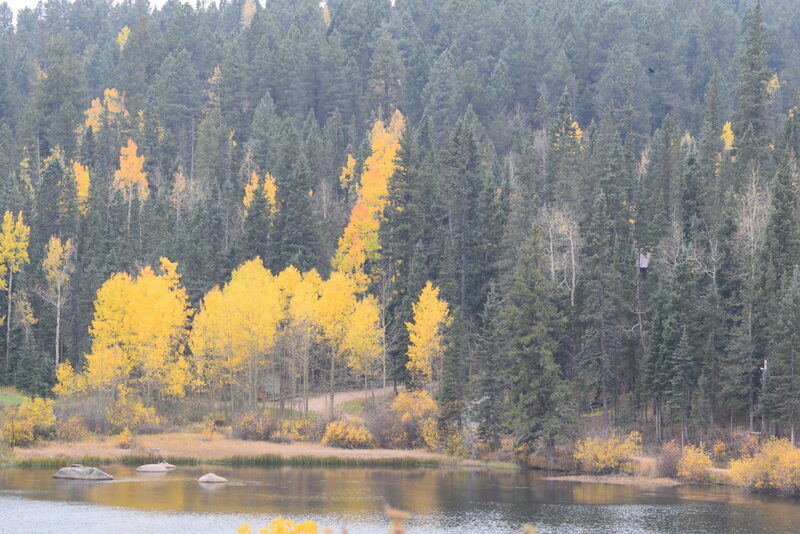 I do love driving to Cripple Creek in the fall. Hope you enjoy this project. Waah! simple and beautiful! like it. Thanks for sharing. You’re welcome! It’s fun to share. Thank you so much for this ! It is just perfect. I love the length and will make it as well as a longer duster version so I can wrap around more when traveling . I can see worked both pieces simultaneously with gradient yarn as well ! Oh, what fun I will have. Starting now for my daughter’s bday! Would you consider making into a dress /tunic to wear over long sleeved t and leggings? Not quite a full perhaps. And a hooded version. Thanks again! 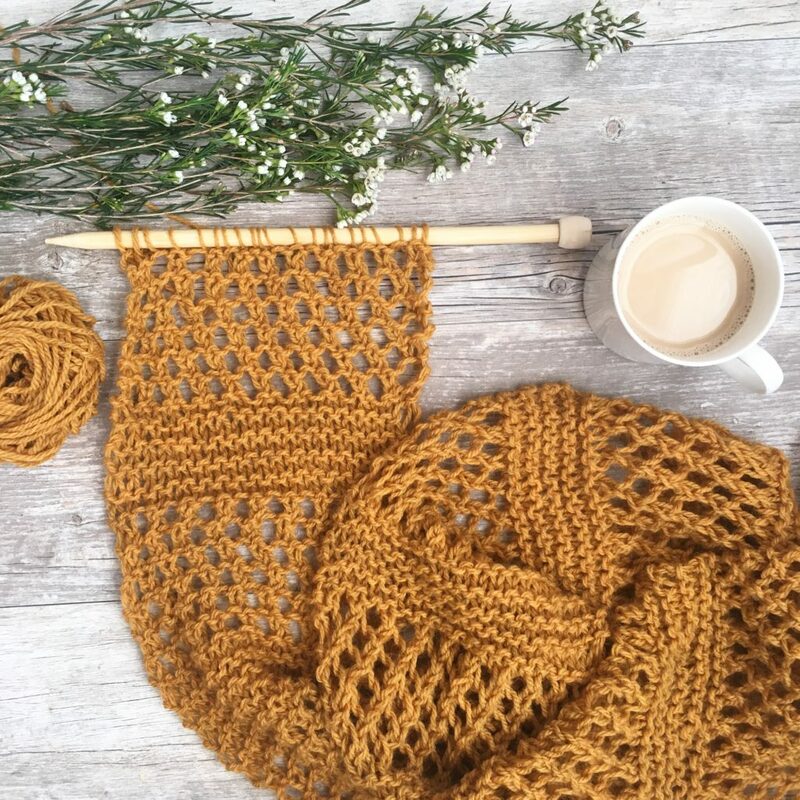 Thank you so much for sharing your knitting and crocheting patterns and inspiration. 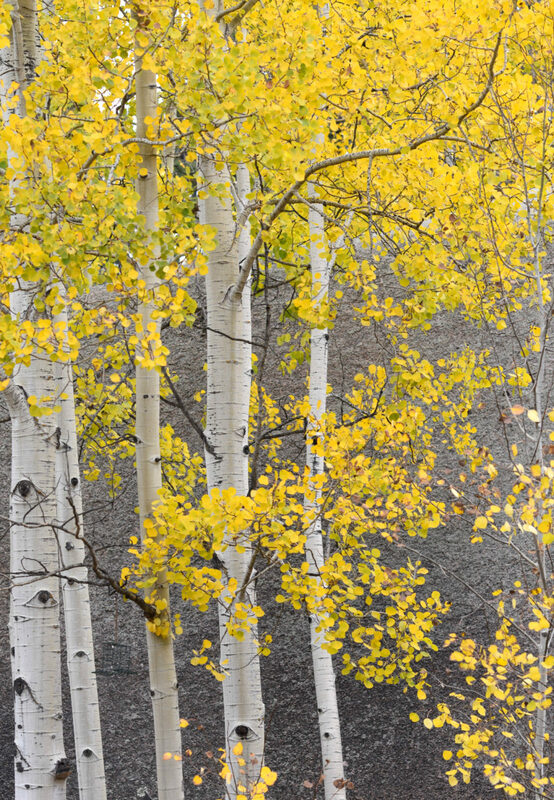 I also love Aspen trees and they are a favourite subject for my paintings. I you would like to see my paintings and creations check out Christine Simpson Art on FB & Instagram. I recently crocheted one of your scarfs “The triangle revival scarf” I love it. I am going to try the Kimono as well. It so difficult to decide what to make because all your creations are do beautiful. Oops sorry it was the “Smoky Mountain Triangle Crochet Wrap” ✨ love it! Another beautiful project!!! Thank you so much ! I just love this pattern Jessica. Thank you for sharing it. You are a true artist with knitting needles :). I can hardly wait to get my knitting needles clicking away on this beautiful project in which you’ve created. Your photos are wonderful. Happy fall to you & yours. Hi Audrey! Thanks for taking the time to leave me a note and for your kind words. Hope you enjoy making it and let me know if you have questions. Happy fall to you and yours also! Thanks so much for this great pattern Jessica – looking forward to making it!! You’re welcome! So glad you like the pattern and let me know if you have questions as you make it! can I use a smaller knitting needle # so that it will not be as large? You can go down to a US 15 or so. Or just adjust the number of cast on stitches (make less) if you want it to be smaller. I love this! Wonder if you are going to do s crocheted version? Made it in a validated gray, navy and burgundy wooly thick and quick yarn. Looking forward to being cozy. Sounds lovely! Thanks for sharing and enjoy! Dear Jessica . . . I love this pattern and rushed out to buy yarn last night. I am making the L/XL and cast on 35 stitches and have measured my one panel and it is 24″ at the most . . that would be a 48″ circumference. I knit very tightly . . but that’s quite a difference . . . what am I doing wrong? Also . . I’m using size 17 needles and 6 weight yarn . . thanks. Hi Linda! Sorry for the delay! 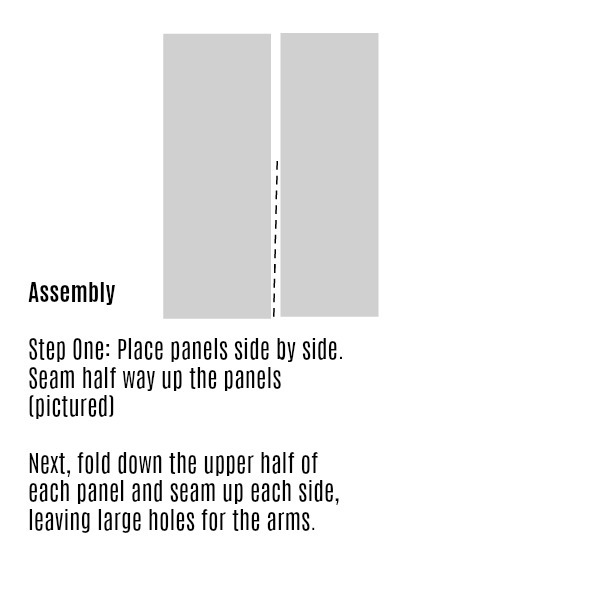 So, note that the panels are folded in two so the circumference is actually 4 of the width of one panel. Does that make sense? Perfectly . . just finished sewing it together . I absolutely love it . . made it in a sky blue color and am thinking I definitely need it in another color . . perhaps steel grey. . . Thanks for the inspiration! I would like to use a much smaller needle size. What is the best way to calculate? I haven’t adjusted a pattern, soon am not sure how to proceed. This is a cool pattern. I’m glad I ran across this, I’ve been wanting something cozy. I think I might make it a little longer. Hi Natalya! Awesome! It will be very easy to make it longer. Hope you enjoy! I made your beautiful Kimono pattern for my daughter and give it to her this weekend. It turned out really nice and she loved the look and how cozy it was. I do have a question though–the ends in the front seem to turn outward and I’m wondering what I did to cause this to happen?? I was going to send a picture to show you but couldn’t figure out how to do it in this reply. 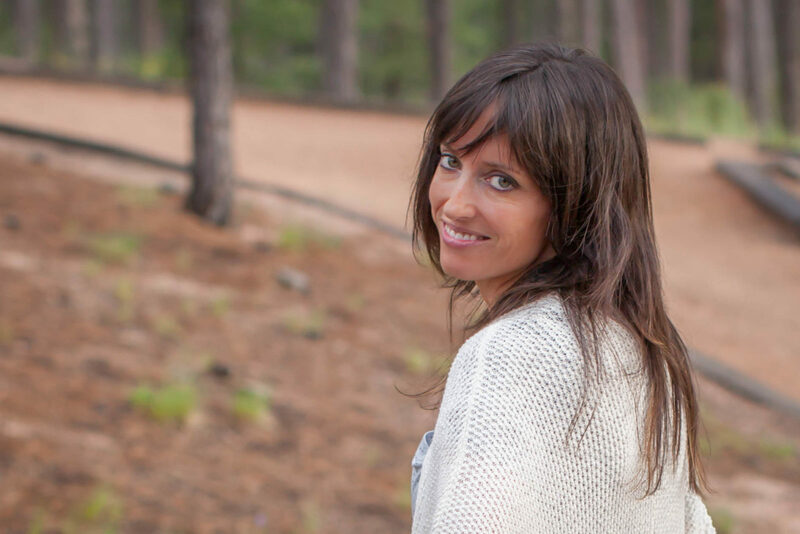 Thank you so much for sharing all of your beautiful projects! Hi Marcia! Sorry for the delay. I don’t know why the ends would turn outward to be honest? I wonder if a simple blocking would help. Feel free to email me a photo if you’d like. One done and it came out great! I already have a second one started. Hehe! Amazing! So glad it turned out great for you! I am a beginner knitter and really thought I’d be limited to scarves. (How many scarves can one person knit before they get bored?) I am SO thrilled to be able to make apparel! I started this yesterday evening and am already 1/3 way done with the first piece. This pattern is so beginner-friendly!! Thank you! Thank you so much for this pattern! I love it, love it, love it! Super excited to knit this up! Alas, the lionbrand.com kit is no longer… ? Actually, found it when I searched, but the link in your post is broken. Thanks for letting me know! I’ll try to get the link fixed. I love this pattern! 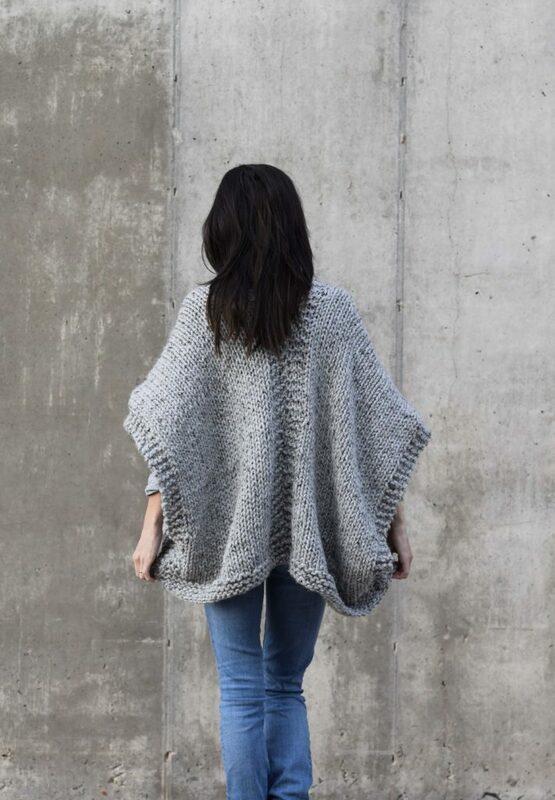 Wondering if I can make it in medium weight yarn instead of chunky since I live in Bay Area and our winter is pretty mild. How do I adjust the needle and how many cast on stitches? (Brand new knitter here :)) thanks!! 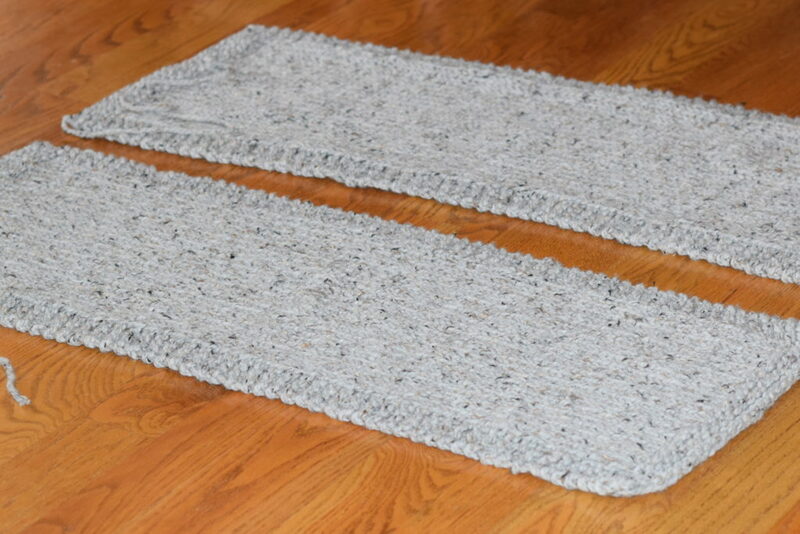 I just made a Kimona from a different link which used crochet for the panels instead of knit. .
Hi JoAnn – I believe what you are seeing is the finished length when wearing, and then the length of the entire panel before it’s folded in half. The panel is two times the length when finished as it’s folded. Hope this makes sense! The Telluride Kimono is beautiful. However, here in our country we don’t really need heavy clothes so i would like to use a lighter yarn and using US 10 or 11 needles. Would you be able to adjust the pattern? I m in a wheelchair.when I go to the Drs. In the fall an winter,it s a hassle putting on a coat. This is PERFECT! So glad this can work for you! Wow. Love LOVE LOVE this pattern!! I can’t believe how easy it is! Just wondering – how long did it take everyone else to make this? I’m thinking of making it for my friend’s birthday, but I’m wondering if I can finish it in time. Also- Jessica, I think my friend is about the same size as you; did you use the S\M pattern, or the L\XL one? I noticed that in the example panels photo, it looked a lot shorter than the one that you were wearing. Thanks! Hi Kiki! I am in the S/M size! Love LOVE LOVE this pattern!! I can’t believe how easy it is! Just wondering – how long did it take everyone else to make this? I’m thinking of making it for my friend’s birthday, but I’m not sure if I can finish it in time. Also- Jessica, what type of cast-on did you use? In the picture, your panels have such a nice, clean edge; did you get that with a simple loop cast-on, or did you use some other method? Thanks! Regarding slipping a stitch before starting a pattern: best advice ever. It creates a looped edge that will astonish you. The only thing you do is add one stitch to your pattern then at the beginning of each row you slip the first stitch from the left needle to the right and then start your pattern. In the directions for the Telluride Kimono the extra stitch to slip was not added to the directions. Example: if you cast on 35 stitches then knit 4, purl 27 and knit 4, which equals 35, you have not allowed for the slip stitch. Solution is to add one stitch or purl 26 instead of 27. I am starting this kimono this evening. Great for Arizona cool evenings, when we get them! Please could you give the measurement of the width of each panel? I have some different wool the gauge of which is 4″ x 4″ = 10sts x 14 rows on 9mm needles. I started casting on 31 stitches but thought it does not look big enough and because I am not sure how big it should be I am not sure how many more stiches to make. Can you tell I am a beginner? Many thanks in anticipation, and I love the pattern! 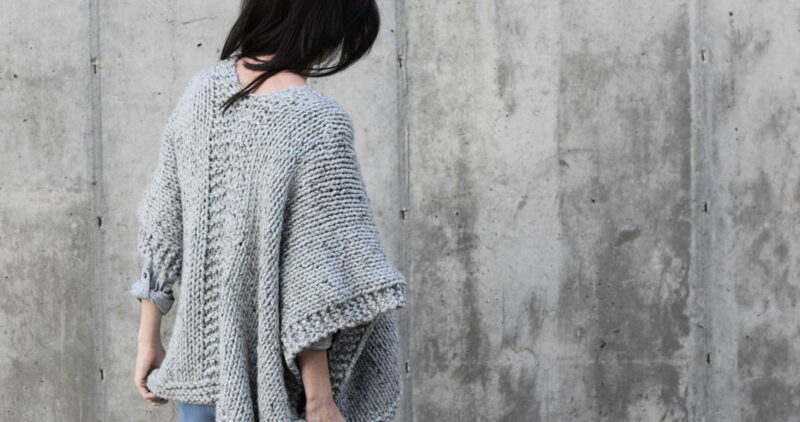 thank you for writing this pattern for knitters…..I have just the yarn for this ! Is it possible to cast on double the stitches, I.e. 75 then follow the pattern with 4 knit stitches at beginning and end of rows with 8 knit in middle. I was thinking of doing this and slipping half of stitches to another needle to “hold” then completing panels to desired length. Then there would be no stitching to hold panels together. Yes! You can definitely do that in order to avoid seaming! hi I was wondering if this could be knit up in one piece? Im horrible at seaming haha.